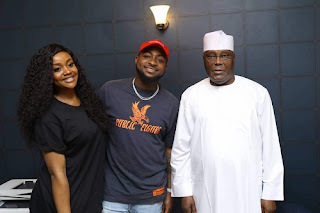 Music star, David Adeleke, popularly known as Davido, and his highly publicized girlfriend, Chioma Rowland, have on Saturday, paid a visit to the Peoples Democratic Party (PDP) presidential candidate, Atiku Abubakar, at his home in Abuja. The multi award-winning singer, took to his social media pages to share a photo from the visit, and wrote: "Thank You for having us sir ! @atiku." The reason for the meeting between the former vice president and the singer, and what was discussed, were not ascertained by TORI News as at the time of filing this report.